Tuesday 13th March 2018 sees the launch of the Calls9 Digital Workplace Trends Survey 2018. This is an exciting opportunity for businesses to have their say on digital in the workplace and be in with a chance of winning one of four prizes of Calls9 time and product development worth £5,000 each. The survey, made up of 10 questions, is aimed at anyone in business - from those who currently embrace digital to those who don’t understand what all the fuss is about. The answers will provide Calls9 with a greater understanding of what businesses think digital is, how it can help them and what they understand about it. “The knowledge and answers we receive will help to shape the digital solutions we deploy in businesses to make them as successful and productive as possible - whether that’s increasing efficiency or improving internal communication,” adds Pete. 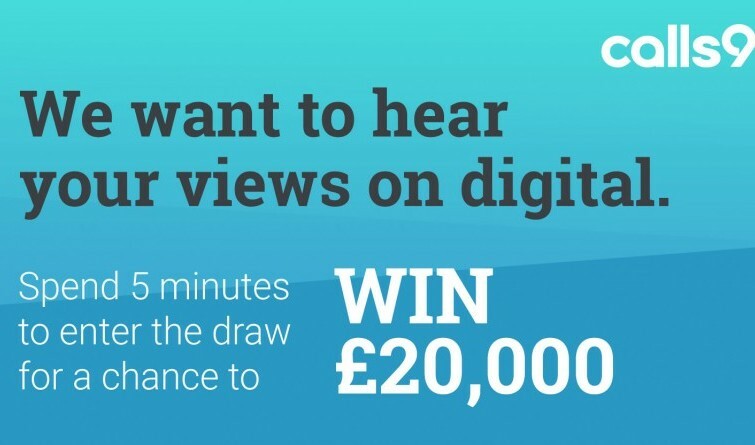 Anyone who takes part in the Calls9 Digital Workplace Trends Survey will automatically be entered into a prize draw to win £5,000 worth of Calls9 time and product development to build and deploy an innovative digital solution. This will help the selected business to drive growth and productivity using digital and as a result, save time and money. To have your say and take part in the Calls9 Digital Workplace Trends Survey 2018, please visit www.calls9.com/digital-workplace-trends-survey-2018 by Monday 26th April 2018. Findings from the survey will be shared at a forthcoming event with more information to follow. Calls9 offer bespoke and innovative digital solutions to drive business growth and increase team productivity in record time. They currently deliver digital experiences to over 260,000 users and are dedicated to making industry-leading products and services to help their customers realise their commercial goals. Calls9 have been named by Prolific North as one of the Top 30 Tech Companies to watch in the North and have been nominated for Independent Business of the Year at the Yorkshire Choice Awards 2018.